The concept of reconstruction and replacement surgeries is simple. Patient complains of pain, a medical provider promises reduced or elimination of pain, patient undergoes surgery to alleviate problem. Sounds simple, but far too often, the surgery performed further complicates the existing condition. One of the most common examples of this occurrence is hip replacement. Companies such as Stryker Orthopaedics, Wright Medical Technology and DePuy Orthopaedics provide the device for hip replacements. If you or a loved one have been harmed by an ineffective hip replacement from one of these companies, Medical Claim Legal can help you get the compensation that you deserve. Why are the Medical Device Manufacturers Responsible? When a medical manufacturer supplies products that are used in medical procedures, they are responsible for the performance of their products. When a patient receives a new hip through a replacement procedure, the medical device used is expected to work properly. If it does not, the patient may be entitled to compensation. 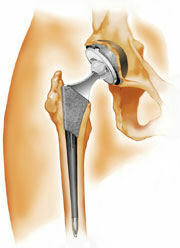 Medical Claim Legal has lawyers who have extensive experience in dealing with hip replacement lawsuits. If you or a loved one have been harmed by a defective hip replacement, we can get you the compensation you are entitled to. Contact us today.